Whenever I’m introduced to someone new, I inevitably get asked what I do for a living. While I would never ask someone if they make enough money to support themselves or pry about personal income, I totally get it. It’s not every day you meet someone who blogs for a living. And, there’s going to be natural curiosity. And, it occurred to me, you might have similar questions too. So, I figured it was about time I answered some FAQs about what it’s like to work from home as a blogger. It varies day to day. There are a lot of emails most mornings. Plenty of coffee. 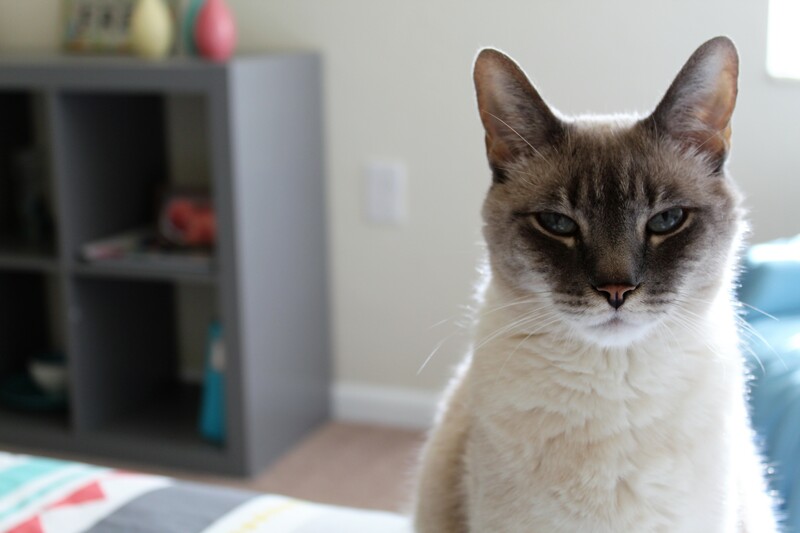 And lots of interruptions from my co-worker cat. But mostly, there’s a lot of content creation. Bloggers are creators. And, the majority of my time, I’d say 75%, is spent creating new stuff — blog posts, newsletters, social media posts, graphics, videos, and digital products. The other 25% of the time, I’m doing routine maintenance — answering emails, responding to social media comments, and fixing broken links or blog errors that pop up from time to time. Do you make enough money to live? You bet! I started my blog at the end of April 2015. But I didn’t start earning enough money to live off of in the beginning. In fact, I was still freelance writing full time and my blog was my side hustle. But, I quickly learned how much I loved blogging and was driven enough to grow my blog quickly. By the end of nine months, I was earning more money as a blogger than I ever did in any corporate role. As my income kept growing, I eventually quit freelance writing to pursue my blog full-time. It was such a gratifying feeling to be able to earn a full-time living from something I created from scratch! How do bloggers earn money anyway? That’s one of the most common questions I get. People know what a blog is. They know what a blogger does. But there seems to be some confusion on how bloggers actually make money. Believe it or not, I make money as a blogger from many different sources. And, I think to be a successful full-time blogger, you need to rely on different income streams in order to make a living wage each month. So, for me, I use ads, affiliate marketing, and digital products to consistently earn money on Work From Home Happiness. A lot of the income is passive — that is, I make money around the clock, regardless of if I’m actually working or not. For example, the week I took off and went to the Bahamas, I didn’t put in a single hour of work, but still made money for ads displayed on my site, affiliate products sold, and digital product purchases. Again, the more content a blogger creates the more opportunities there are to monetize. Really, the sky’s the limit! You get out of blogging what you put into it. How can I become a blogger? It’s actually really easy to become a blogger. Anyone can start a blog. But it’s not so easy to become a full-time blogger and earn enough money to pay your bills every month — but it’s certainly possible. If I can do it, so can you. Remember, there is a lot of content creation in blogging. So, if you don’t like writing, you’re not going to enjoy the blogger life. Similarly, it takes a lot of (wo)man hours to get a blog off the ground. You might work 40+ hours a week on your blog in the beginning and see VERY little income in return. But, if you have the drive to learn as you go and to stick with it for the long haul, you too can go from newbie blogger to full-time blogger. But to eventually reach that point, you have to actually get started. To help you out, I’ve created a step-by-step no-fail beginner’s guide to starting a money-making blog. Be sure to check it out! No two blogs are created equal. But, there are some pro-blogger tools you need to know about in order to turn your blog posts into cold-hard cash. Here are some of the blogging tools I use to make money every month as a blogger. When you start a blog, you also want to start an email list at the same time. And, from there, create landing pages and opt-ins to get people to sign up for your email list. Why? Because email marketing is key to blogging success. Even a teeny tiny email list can earn a blogger thousands every month. That’s why I recommend you invest in a solid email marketing platform from the very beginning. This will make it easy to turn blog visitors into email subscribers and, eventually, email subscribers to paid customers! I’m a DIY kinda gal. I don’t mind rolling up my sleeves, firing up YouTube, and learning how to do things on my own — especially where my blog is concerned. That’s why I love WordPress. It’s super easy to use AND allows even the most non-tech savvy (like me) to create professional looking blogs without ever having to code. But, it’s important to know, there’s a big difference between WordPress.com and WordPress.org. If you want to earn a full-time living as a blogger, you need to be using WordPress.org (it’s free). However, you will have to pay for monthly hosting every month (more on that next). The reason it’s worth it is because you get your own branded blog like YourName dot com or AmazingBlogger dot come and not YourName dot WordPress dot com. Plus, when you use a free platform, like WordPress.org, you’re limited in how you can earn money from blogging — and that’s not fun! When you go the self-hosted route as a soon-to-be pro blogger, you need a hosting provider to get your blog online. Think of your blog host as your blog’s landlord. You’ll pay a monthly ‘rent’ to the host and they’ll provide a place for your blog to ‘live’ online. When you’re a newbie pro-blogger, I highly recommend BlueHost! Not only are they super affordable (at less than $3 a month), BlueHost also comes with a satisfaction guarantee and amazing customer support. If you ever have a question or unhappy for any reason, they’ll fix it or give you your money back. You seriously have nothing to lose. In the spirit of keeping things simple, I recommend Genesis themes for all WordPress bloggers. Genesis is a WordPress theme that has A LOT of options. So, whether you want to start a lifestyle blog, food blog, fashion blog, or anything in between, you can find the *perfect* Genesis Child Theme. The best part? Genesis themes and child themes are super simple to use. Each one comes with step-by-step instructions on how to set them up and, out of the box, look super professional and polished. 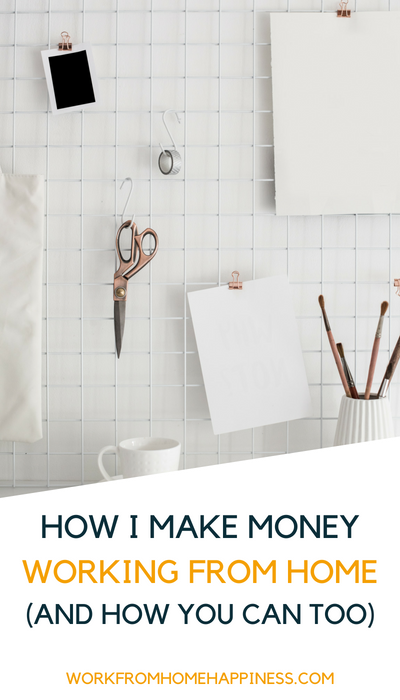 There you have it — how I make money from home as a blogger. And how you can too. If I can do it, so can you. Promise. Questions? Comments? Curious inquiries? Hit me with them in the comments below! The post How I Make Money From Home (And How You Can Too) appeared first on Work From Home Happiness.